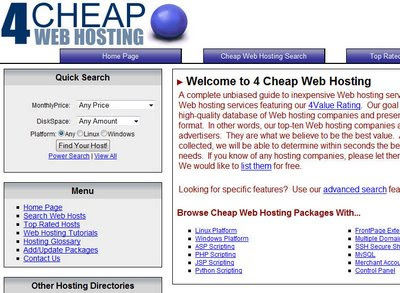 In search of a web hosting comparison and review site I stumbled upon 4CheapWebHositng.com. With a clean layout this website offered the things I or anyone searching a web host needs to know about web hosts put in a coherent manner.With that in place the categorization of hosts as per platform like Linux, Windows or scripting language like PHP, ASP, JSP makes it easier for the person searching for a web host. The quick search on the left comes in very handy if you want to search for a specific price, platform or disk space required. 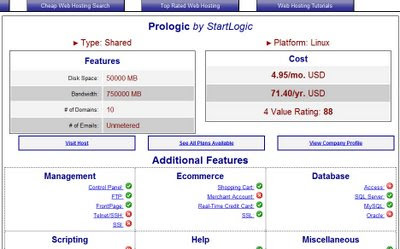 The graphically shown feature list of the host as one shown below, makes it easy for you to know what features does the web hosting service provider provides you on the first look. The search results appear in a well placed manner and the rating given seems to be quite accurate and honest. Even with a clean and simple design the website effectively communicates important information in a graphical and easy manner. This site lists Affordable Web Hosting options on your finger tips with more than 200 approved web hosts that offer over 400 packages to choose from. On top of it if you own a web hosting company you can list your web hosting service on this site for free. The website is built with PHP and with use of a framework I guess but definitely the clean URL are search engine friendly.It has a clean layout with pretty fast loading pages. Search is also fast and it lists the web host and its plans which is good. A page you should not miss out is the Hosting Glossary page that give information about the terms used in hosting like bandwidth, mailing list etc etc. For more help also check out the web hosting tutorial they provide. All in all, if you are looking for a Affordable Web Hosting then you might find the right one at 4CheapWebHosting.com. Have a look.